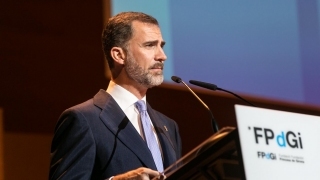 This afternoon, as part of the sixth edition of the IMPULSA Forum, the presentation ceremony for the Princess of Girona Foundation Awards 2015 took place in an event presided over by Their Majesties the King and Queen of Spain and attended by more than 1,200 people. The FPdGi Awards recognise the innovative and exemplary work of young people aged between 16 and 35 years, and that of an organisation working for young people, with the aim of promoting and fostering initiative and effort in areas such as scientific research, artistic creativity, solidarity and the development of talent in entrepreneurial and innovative young people. In this sixth edition of the FPdGi Awards, for which a total of 167 nominations were received, the winners are Olga Felip, in the Arts and Literature category; Héctor Colunga, Social; Samuel Sánchez, Scientific Research; Bernat Ollé, Business; and Fundación Secretariado Gitano in the Organisation category. With a prize of €10,000 and a reproduction of a sculpture by Juan Muñoz, the awards recognise the work of restless young people who want to build a more just world in a globalised setting, who have the capacity to take risks and who are sufficiently motivated to bring about changes in our society. In his speech, His Majesty the King highlighted the work of the Foundation which, with every new IMPULSA Forum and edition of the Awards, has continued to progress, turning this event into a platform and an example that shows many young people that their dreams can come true. King Felipe also made special mention of other projects run by the Princess of Girona Foundation, such as Mentoring Talent. “This project seeks to contribute to efforts being made by society in favour of employment. Allow me to encourage you not to stop searching for all the tools available to improve your employability and your personal and professional prospects”, he said. In support and recognition of teachers, His Majesty the King summarised the Foundation’s work in this area, stating that “we want to support and guide those who are driving educational change: teachers”. 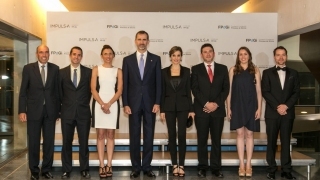 Addressing the young people in the audience, King Felipe urged them to “be willing to take risks, to lead and to provide unique value propositions and solutions”. Holding up the example of the winners of this edition of the FPdGi Awards, he reminded the audience of the importance of hard work and starting again as “progress and improvement do not only occur when we achieve our goals, but also when, in trying to do so, we do not succeed.” In his speech, he also thanked all of the winners for sharing their talent with society, for not being afraid of hardship and for bringing everything they have learned and that has improved them back home. 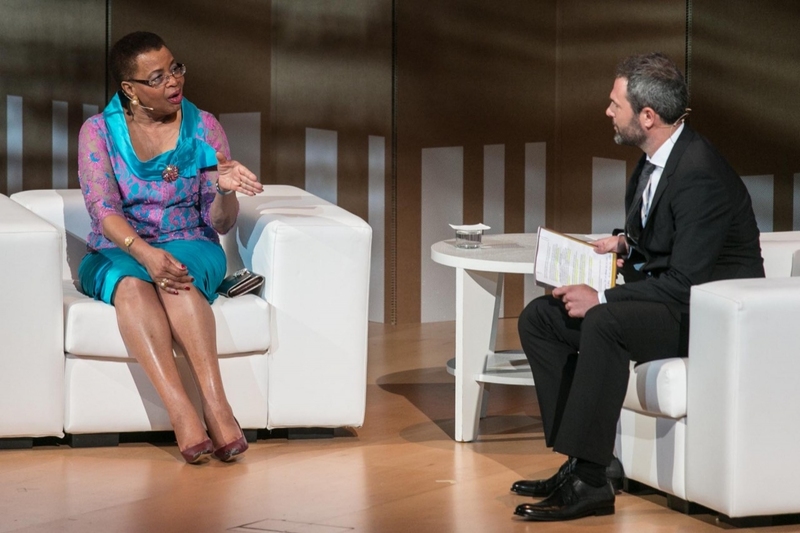 The FPdGi Awards ceremony, held today at the Girona Auditorium-Conference Centre, marked the launch of the IMPULSA Forum 2015, which was inaugurated by Graça Machel, renowned activist for the rights of women and children and widow of Nelson Mandela. In a conversation with journalist Xavier Aldekoa, Graça Machel placed great emphasis on what she considers to be the centre of her life: education. Machel highlighted that among the challenges facing a continent with such a young population as Africa is a great need for investment in education, health and infrastructure that will allow opportunities to be built for its young people. “Young people can become an important asset but first good, sustainable investment must be made in them”, said Machel. Furthermore, this well-respected social activist underlined women’s role in and their capacity to empower their communities in what she called “a strategic investment that strengthens the community in the very broadest sense”. The ceremony also included a musical performance by Marc Heredia and a talk entitled Giving an increasing number of young people the opportunity of their lives, by Andrew Devenport, expert in business development and CEO of Youth Business International. Humorist and writer Juan Carlos Ortega was the moderator of the round table discussion with young winners from previous editions of the Awards, who shared with the attendees their personal experiences of what receiving the Foundation’s award meant for them and how this influenced their subsequent professional and personal development. The young people taking part in the round table were 2013 FPdGi Scientific Research Award winner, Oriol Mitjà; Felipe Campos, FPdGi Social Award 2013; violinist Leticia Moreno, FPdGi Arts and Literature Award 2012; and entrepreneur Javier Agüera, winner of the FPdGi Business Award in 2012. In a speech made on behalf of all this year’s award winners, the architect from Girona Olga Felip expressed their gratitude and emphasised the important role of young people as global actors who, despite having uncertainty and change as their natural habitat, are not afraid and are confident that our society will be better tomorrow. “This condition does not frighten us, instead it makes us strong, resilient and free”, said Olga Felip. “We are concerned about local issues applied globally. Because we are global: we are connected, we work in networks and we have the capacity to overlap situations, to cooperate, communicate and share”. Coinciding with the FPdGi Awards ceremony and the IMPULSA Forum, this afternoon the 12th meeting of the Princess of Girona Foundation’s Board of Trustees was also held. During this assembly a review of the Foundation’s activity was presented and the 2014 accounts were approved. In this meeting, in accordance with the Foundation’s articles of association, Francisco Belil, vice-president of the Bertelsmann Foundation and member of the FPdGi Board of Trustees, was appointed as the new president of the FPdGi, taking over from Antoni Esteve. FPdGi Arts and Literature Award 2015: Olga Felip Ordis, an architect from Girona, was recognised for her demonstrated ability to combine the creation of new forms with respect for the environment, and her sober, elegant, warm and bright designs. FPdGi Organisation Award 2015: Fundación Secretariado Gitano, for its work to promote social inclusion and equal opportunities for the Roma community. FPdGi Social Award 2015: Héctor Colunga Cabaleiro, for his continuous, coherent and committed entrepreneurial work, through projects that contribute towards creating social capital and renewing forms of participation. FPdGi Scientific Research Award 2015: Samuel Sánchez Ordóñez, from Terrassa, who was recognised for his highly international scientific career that reflects his leadership in the field of nanotechnology, and which has had a particularly important impact on the pioneering design of self-propelled nanorobots, which could have medical and environmental applications. FPdGi Business Award 2015: Bernat Ollé Pocurull, in recognition of his excellent academic achievements and international business career, which has resulted in four business initiatives. 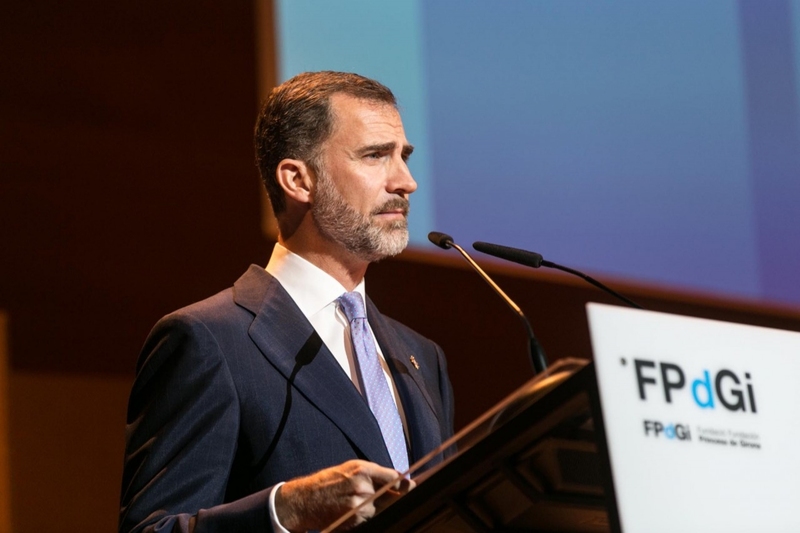 Taking advantage of the award ceremony, the Princess of Girona Foundation also announced the launch of the nomination period for the next edition of the FPdGi Awards, which will remain open from today, Thursday 25 June, until 30 November 2015. All people and organisations interested in taking part can present their nominations on the Princess of Girona Foundation’s website, where they will also find the terms and conditions of entry as well as online application forms. Under the slogan “IMPULSA: the forum of your opportunities”, the Princess of Girona Foundation has organised a Forum which, with a new format and new content, is designed to place young people at centre stage, encouraging them to come together and share their experiences with each other, the guest speakers and a wide range of professionals and entrepreneurs. The programme includes forty activities in which almost 70 speakers will be taking part, making up a schedule divided into five thematic blocks all focused on fostering entrepreneurial initiative. Tomorrow, Friday, more than 800 young people between 16 and 35 years old from all over Spain will be taking part in an event designed to offer young people the tools and resources to strengthen their entrepreneurial skills, talent and capacity, while sharing them with other participants and professionals. Attendees have been able to build their own schedules according to their concerns and interests, choosing from numerous simultaneous activities included in the five thematic blocks: Points of View, Professional Skills, Entrepreneurship Project, Personal Development and Educating Talent in Schools. Among the new features in this year’s edition are A Word from the Wise, in which eight young people will put their entrepreneurial initiative to the test by presenting their projects to a Council who will evaluate them and study their viability. Meanwhile, the Close Encounters have been one of the most sought-after activities by participants. Held in centrally located restaurants in Girona, these sessions involve a maximum of 10 young people per meeting, allowing them to share their experiences and knowledge with renowned experts and professionals over lunch. The popularity of this initiative is demonstrated by the fact that the 200 places available for the Close Encounters were filled in only 10 days. The activities on Friday morning start at 9.00 am and go on until 4.30 pm. There will be a party in the Platea venue to bring the IMPULSA Forum to a close, with the BEATBOX BARCELONA activity, designed to interact with all the attendees in a fun way, and a scientific monologue given by Eduardo Sáenz de Cabezón.